Let the Mooney Twins provide the “Conscious Comedy“ with social entertainment/celebrity gossip and/or political commentary to delight your group; organization, platoon, ceremony, fundraiser and events. With humorous criticism on social happenings, the Mooney Twins will dazzle your audience, ease tensions and break the ice at your organization’s function. 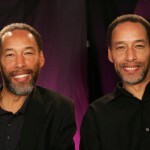 The Mooney Twins will ignite your event with dynamic energy.